(08-20-2018 05:22 PM)pug-thug Wrote: and is it true they are still using FACE THE PAIN? can they be this out of touch? 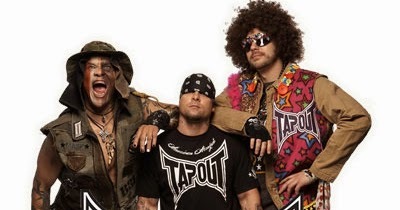 Lol I just saw that UFC inducted the Tapout guy into their Hall of Fame. T-Shirt money is apparently just as important to the UFC as the fighters. I actually sparred with this guy a few times back in the day. He was very big and uncoordinated. The taller guy in the crew was a little bit better but not by much. I always considered him and his crew mega posers; the god-fathers of MMA Poserdom. They were really a driving force in associating the Nu-Metal culture with UFC Fandom. Quote: "Semantic satiation (also semantic saturation) is a psychological phenomenon in which repetition causes a word or phrase to temporarily lose meaning for the listener, who then perceives the speech as repeated meaningless sounds." ^ This is basically what is happening across the board all over the world in all levels of life. Oversaturation. If you get interested in something like lets say Thai boxing, you can now binge on the thousands of Thai boxing vids out there until you kill your interest for good. If you are interested in architecture and city infrastructure, you can go to google images and binge on the thousands of pics of all sorts of amazing buildings, until you no longer find them amazing but trivial (in any case architecture is appreciated not on pictures, but by walking around and generally living you life in and between buildings and parks). Same with nature - the Alps are probably amazing, but not after the wall of pics I consumed. Things used to have a natural pace about them. If the album you wanna hear is out, you get it, sit down and listen to it, and go on trips with no need for drugs. That one videogame you've been waiting to play for months, ever since you saw 3 screenshots and a 2 paragraph description in some magazine - take your time with it, it will be a few more months before your next one. No extra cash for entertainment - no problem. Walk for 50 minutes to the nearest Borders Books and Music, go over this weeks magazines, read a few mangas, a few walkthru book on games you might never get to play, then head on up to the music section and sample the goods. Occasionally you find a surprise masterpiece of an album that you will have to buy, but only once they take it out of the sample section. Walk out the store, get yourself some cheap garbage snack and munch on as you savor the beautiful downtown night time skyline. Walk on home for another 50 minutes as you dream of all sorts of things, and go to bed in you tiny apartment with incredibly expansive mental horizons. This is the correct way to me. I feel bad for the binge generation that can't compare this current world to the previous one. Remember that feeling, the new issue of video game magazine is out! On the other hand you had more boring days with absolutely nothing to do. Now every day feels more or less the same. you're never really bored, never really excited. That psychiatrist William Reich used to say that the rhythm of life is Tension, climax, discharge, relaxation. I think he was onto something, there's something dehumanizing about this extreme efficiency and abundance we have today. “Dana, he was a really big fan of our style of music. do these people know how bad the music is? right now life is just a wave with the same amplitude. a bit above quiet, but not quite medium. sure you're pumped for the olympics or world cup, but Pride went beyond that. those organizers after Pride 25 put their heart and soul into it. how does this guy go from making that great pride vs. UFC vid, but then come up with this sorry top 10 list? Gomi and sakuraba need to be in this list. Gomi had the greatest LW run in history period. Sakuraba was the best open weight fighter. US corporate types always choose stuff that doesn't last. You can tell that in his mind greatness is defined by "long streak of title defenses" and only that. Hence why he only picked Wandy and Fedor from PRIDE. He comes off as a simpleton in that vid. Hendo belongs in that list and GSP does not. Mighty Mouse, Cormier and Jones shouldn't be in the all time top 10 imo. Nothing that Demetrius Johnson has done can touch Nog's fight against Bob Sapp in PRIDE. also peopel who get busted for ROIDING have to be docked a few points. another good PRIDE FC original. A lot of those old mma tracks have a 16 bit era vibe to them. ^that sounds straight out of a Capcom or SNK game from the 1990s. Hard rock with synthetic flute adding some melancholy to it. Reminds me of a T-SQUARE song that I love called "Truth" which Fuji Tv used as their F1 opening theme for a long time. Same PRIDE-esque vibe.